The Jabberwocky will probably ever be the epitome of this category, but I was wondering what other examples there might be. It may be a stretch to even say there is such a category, but I figured if there was anywhere I might find more, it would be here. I thought of this question the other day after amazing the students on my bus with something my Dad used to befuddle my young mind with. came and shot those two dead boys. ask the blind man he saw it to. Wow it turns out there is such a category, I did a search using the first line of this poem, and found a Wiki page "Nonsense Verse"
Thanks Epiphileon for rekindling an old passion. JJ, nice one there, but methinks not all witty and irreverent verse is 'nonsense'. If it was, almost ALL of Ogden Nash's output would qualify, eh? There has to be some sense of absurdity about the content. In fact Edward Lear and Lewis Carroll who excelled in this craft before it became a recognised genre, are often considered ancestors of the Theatre of the Absurd. There stood a brown ant on an elephant's toes. "Get off you bully! Find someone of your size!" I'm really surprised that the entire genre has thus far passed you by. Word-play, riddles, neologisms, double meanings, puns etc. are all part of this genre - whose earliest written examples show up from Old English - the first recorded examples of the English language. In Middle English it reached it's zenith when "Wit" was considered a primary function of English. This is probably because minstrels, 'fools', baladeers, pedlars, travellers, were always welcomed with excitement across a mainly rural country. Those who could entertain with the most nonsense were always sure of bed and food and shelter, and rose to be in demand. There were always some attached to the Court and often to private and powerful households. These familiar tropes explain the tumultous reception of Pilgirm's Progress. By the time we get to Early Modern we have hundreds of examples - from the plethora of printed texts specifically from the world of the Theatre. There was - and still is - a huge distinction between slapstick or comedic roles and this of "wit" and 'fancy'. The most prolific resource for those who aren't familiar with historical literature would probably be found in Shakespeare. Unfortunately though, many of the neologisms in Shakespeare have entered the English language so that many of those reading him 600 years later don't even know how side-splittingly innovative and witty these were to contemporary audiences. (The 'artisans' speeches in Midsummer Night's Dream had 'em rolling in the aisles back in the day, but seem a bit naive and just rather stupid to modern audiences.). The 18thC - the days of Steele and Sheridan - brought us satire; and this form of wit for a time eclipsed the traditional forms. But then the great Victorian era dawned and "wit and nonsense" became the most popular kind of humour. Victorian children's books are a positive cornuccopia of nonsense-words, nonsense-poems, nonsense stories. From Edward Lear to Spike Milligan, from theatre to TV panels shows, from Variety Shows to Monty Python, this integral part of our language is one of the aspects of English most prized, applauded, and laughter-provoking to BE speakers. OK, so I guess you weren't expecting a history lesson - but this, to me, is a key factor in understanding the difference not just between British and American humour, but across the very dialects of BE and AE, (and which causes a lot of misunderstanding! )...which is a whole other subject with which I shan't bore anyone further! It's not "it's zenith". It should be "its zenith". Romany, when are you going to give up harping on my English or other members' English with a malicious intention of belittling us when you need to improve yours? Oh for godsake, Frosty, When are you and Almo going to give up on abusing me and accusing me of evil thought and deed? Both of you have been doing it for yonks. Both of you have left - and in Almo's case at least it was because he was banned - and both came back and started again. Neither of you do it to any male posters. When I just ignore it you step up the action, and when I expostulate you attack me. It's been done to Hope - the only other female member who regularly posts. (And poor Koh has come in for dreadful abuse too). "Harping on" about your English? Or anyone else's? "Malicious", "belittling"? You know what? Start throwing that kind of stuff at some of the male posters. Or is picking on women the only way you guys get your jollies? Act like real men. Zenith of a genre, high wit in the nadir beneath. Turn in his grave-and that’s no trope-if he could. Oof!! Romany for PM! Step aside Theresa! Go home Boris! your lash on Romany was unnecessary and rude. All of us make typos now and then, there's no need to snipe when you see one. Rom is NOT belittling members who ask for help with their English. Some of your comments seem to be personal attacks, not fruitful discussion. Yes - it all goes back a long way. Though Carroll - not only with Alice and the poems included in those books, but in his other verse - was a master, he was not the first. 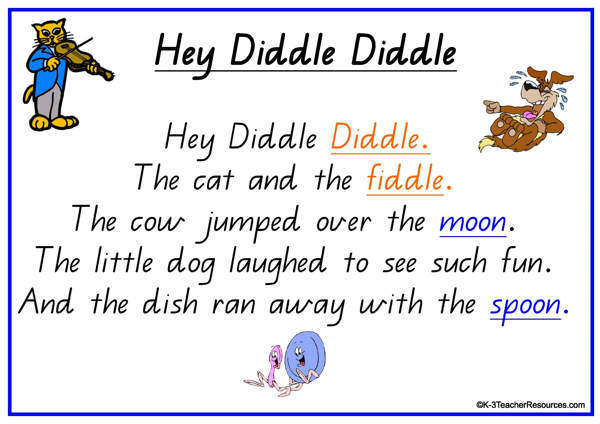 The earliest pub called "Cat & Fiddle" was already open by 1590 - so the rhyme must have been well-known by then. * I know bundles in German, but like most poems, these are very hard to translate adequately. Maybe later. Thank you very much everyone who chose to post on topic, I enjoyed reading all of them. Romany thanks for the overview, I have always appreciated your informative posts, as my education is heavily lopsided having almost entirely skipped the secondary level. Frosty (SMH) What the hell?, Not only is your lash at Romany, harsh and rude, (there is no need for me to set myself as a judge of this, it is unmistakable in the context of this thread), but it is entirely off topic. This forum used to be a place for rational discussions, and edification. If all members would return to polite discourse, we may actually be able to re-foster the type of useful dialog that occurred here at one time. In similar vein - particularly popular when I was young - is this style. This is part of the biography of Professor Stanley Unwin. Stanley found his fame by accidend, this whole fame did come about because instead of use the fundermold of the basic Engly twentyfido to carry out a testy-testy 123 he did useit the corruptations gobeldygook Unwinese in some great folly. Well, when the great boss men what reside way up and above the floor of the studio soundy worky men below did hearit this corruptatious testy testy recordy of the gibberish words and sacrilade of the Engly languid, yet clearly counjoury of the imagy it was. These great and powerful men did decideit that the maker of this strange languid would make a great comedie and giveit the opportunitode to turny and come over t'other side of the microphode, Oh yes! It was with deep joy that Stan discoverode that he could make many toils the salary of a yeard, with one or three days of talky his Unwinese, and furtherly that his languid could make laughter amongst the peopload and giveit him opportunitodes to worky with great comedie ands such as Spike Milligan and Peter Sellers. Unwin worked on the radiode and televode, untill became he a housey holdy name in the nineteen fiflies. He made the "Rotatey Diskers with Unwin" LP which includey many such once upon a titos and Unwin speaky on many a subjey. O yes! As Stan's fame did grow, he made appearends in cameodes in the famous filems of the ear, such being "Chitty Chitty Bang Bang" and "Carry on Regardless" and in numerode commercials of the televode. In nineteeen hundy and sixty ade, Stanley did make his greatesd contributy to the musicold when he did narrade the concept album "Ogden's Nut Gone Flake" for the Small Faces, carrying the rythmold’n sound of self expressy-ho to infinny in the cosmos for sure. Deep joy. Thank you Drag0. This reminds me of parts of my long-lost youth, when I enjoyed - among others - the music of the Small Faces, especially their album 'Ogdens' Nut Gone Flake', which included the story of Happiness Stan. I love Unwinese, although I only understand about half of it, hobbery hobbery. Here's his his rendition of that story. Here's also a recording ('Just the words') with considerably better sound quality. Edit: Oops. When I saw Unwin in Drag0nspeaker's post, my mind immediately carried me away back to the Sixties that I didn't even finish reading. I would have seen him mention that very thing. Sorry. There is of course this gem as well, "The Turboencabulator"
Better late than never, I hope. This poem is (obviously) a take-off on the nursery rhyme, "The House That Jack Built". There are many shorter poems in the book, but I found this one on line and it was too good to pass up. You can doubtless find others on line. I understand the book, originally published in the late 1950s, is back in print. I highly (highly) recommend it. It actually makes perfect sense! And said, "That pig has had his chips." "No, no, by the hairs on my chinny-chin-chin!" He shouted, "Bacon, pork and ham! Oh, what a lucky Wolf I am!" The Wolf said, "Okay, here we go!" He cried, "Oh Wolf, you've had one meal! Why can't we talk and make a deal?" The Wolf replied, "Not on your nelly!" "But still I'm not quite satisfied! But oh, how I adore indulging." "You'll not get me!" the Piggy cried. "I'll blow you down!" the Wolf replied. And I don't think you've got enough." "I'll have to blow it up instead. And yelled, "Well done, Miss Riding Hood!" Where were his spectacles? Could someone have stolen them? Had he mislaid them? What was he to do? are different, yet similar somehow. Oh, what it is? I see it now! are quite the largest ever known. are 80 times their natural sizes. way out yonder in South Dakota. "I see!" said the blind carpenter, as he picked up his hammer and saw.